Reader Allen Thomson sends along this image of the AlKibar dated 23 November 2007 showing an apparently thick slab of concrete over the remains of the BoE and one or two construction cranes erected on it. 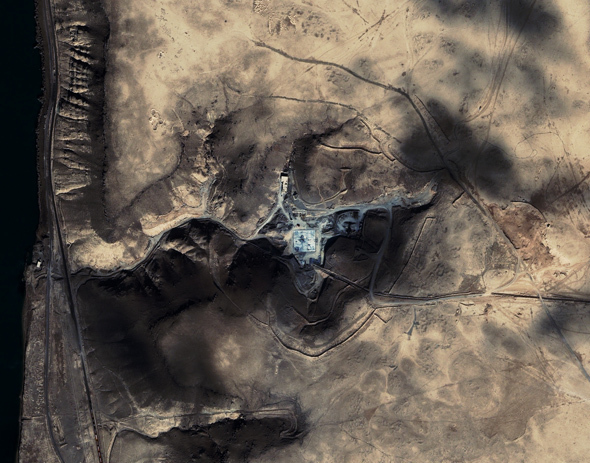 Credit:GeoEye/Space Imaging Middle East IKONOS Satellite Image. A very curious set of stories appeared yesterday about the results of environmental sampling that the IAEA conducted at the AlKibar site. ElBaradei is said to be irked at the leak. Well, that’s not surprising. The presence of processed uranium (it is unclear it is enriched or in the form of metal) has many possible implications. There wasn’t supposed to be any reactor fuel on site and the IAEA didn’t find any evidence of graphite — though that isn’t particularly exculpatory (see: Mark Hibbs, “Evidence form IAEA graphite probe not critical to Syria reactor case,” Nuclear Fuel 33:21, p. 7). Maybe it was cross contamination from the North Koreans. Or maybe Syria has some enrichment efforts. But, at least today, I think the story hit the papers as part of an effort to press ElBaradei to request a “special inspection” in Syria. The real reason that ElBaradei is reluctant may have more to do with ongoing Israeli efforts to engage Syria. Hibbs has reported that the effort to pressure Syrua has “run aground on a separate diplomatic effort … to encourage Syria to isolate Iran (Hibbs, “Diplomatic efforts to engage Syria hindering US-led campaign at IAEA,” Nuclear Fuel 33:20, p. 4). So, that’s the rub: Some countries — read the US — want ElBaradei to push for a special inspection — which the Agency has only requested twice in its history. ElBaradei has said that he won’t unless there is evidence of undeclared nuclear material. So, delegations are seizing on the uranium finding — however scant — to force ElBaradei’s hand. You can see why the DG and the IAEA might be irritated, particularly if the evidence is less clear-cut than the diplomats are suggesting. And while I won’t condone using a leak to press for a preferred outcome, I would like to see the IAEA request special inspections as a more routine measure in cases when a state does not have the Additional Protocol in force. Syria does not and if there was ever a case for a special inspection, this is probably it. As I mentioned, the IAEA has only requested special inspections twice — once at the request of a state (newly democratic Romania in 1992, which discovered that the Ceauşescu regime had a clandestine nuclear program) and once in an adversarial relationship (the DPRK rejected the IAEA’s request in 1993, although the inspection was eventually carried out under the Agreed Framework). Part of the problem, I think, has been the IAEA’s reluctance to request special inspections. By making them rare, they are unnecessarily adversarial. I highly commend, via James Acton’s recommendation, a paper by John Carlson and Russel Leslie entitled, Special Inspections Revisited, (Australian National Safeguards Office, July 2005). They make the rather compelling point that special inspections ought to be conducted more often, as a normal and nonconfrontational part of the safeguards effort when a state does not have the Additional Protocol in force. Moving toward that norm almost certainly requires requesting that Syria grant a special inspection. Residue from one strafing run is enough evidence for me. Why wait, DG? On the technical side, what should a special inspection of the al Kibar site consist of? In my current state of ignorance, I’d think that several core samples to a depth of at least 25 meters at the location of the putative reactor core would be needed if further surface sampling were inconclusive. The original Reuters item talked about a Uranium compound which is not a natural ore. This could be for example yellowcake, the product of the phosphate separation micro plant in Homs. I’m not sure but it could possibly be the depleted Uranium used in many US aerial munitions some of them are used by Israel. Andreas Persbo said in his ACW blog the Syrians considered using the very near Tibnah salt mine for storing radioactive waste. This could possibly be a third source of Uranium. Assuming the Syrians stored there the Homs product, then someone who visited both sites could carry it on his clothes, a scenario mentioned by the Reuter’s source. Yet another possibility is that the Syrians were framed using a UAV. Andreas tells us in his blog there is severe pressure on the IAEA analysts and they are avoiding their department colleagues because of it. This sounds very bad. By the way, US aerial munitions contain also Magnesium and Zirconium, the ingredients of Magnox fuel cladding. Finding enriched Uranium in Syria doesn’t support the US story because the alleged nuclear reactor was said to be a Magnox and these usually work on un-enriched Uranium. Mr. Andreas Persbo didn’t say the IAEA analysts working on the Syrian case are under pressure. He described the internal situation in the IAEA without even hinting or implying there is any pressure. His description seems to me a clear indication of such pressure but this my own personal interpretation. One thing that may be relevant to the question of an IAEA return to Syria is just how much information they already have that might guide their inspections. Recent statements by ElBaradei suggest that they’re feeling slightly information-deficient. [Wolf] BLITZER: So what you´re suggesting, Dr. ElBaradei, is neither the Israelis nor the U.S. government – or for that matter, any other government – gave you any hard evidence to back up this claim that this was a North Korean modeled nuclear reactor. ELBARADEI: Or any evidence at all. Not only hard evidence, Wolf. ELBARADEI: I don´t know. I mean, I never – I never got a shred of information from anybody, Charlie. [Charlie] ROSE: Did anybody ask you to find out for them? ROSE: Have the Israelis given you information? ROSE: Has the U.S. given you any information? ELBARADEI: No. We didn´t get any. ROSE: Did you ask for it? ELBARADEI: Of course, we did. “But I also continue to call on all these countries who have any information including satellite imageries to share it with the agency,” Elbaradei said. How about the source being US manufactured GBU-28 bunker busters which contain depleted uranium and which have been sold and delivered to Israel? Failing that, what is the probablity that dust from depleted uranium weapons used in Iraq would blow across Syria? From my reading of Syria’s safeguards agreement (INFCIRC/407), by virtue of the PROTOCOL on the last page, the bulk of Part II is held in abeyance until Syria has 10 tonnes of natural uranium, or 1 effective kg or special fissionable material, or has “nuclear material in a facility”. So am I right in thinking that if a state like Syria is just doing initial R&D on fuel production, using fairly small quantities, then the bulk of the safeguards agreement does not come into action? Even if the state had a complete but unfueled reactor sitting idle? 10 tonnes of natural uranium isn’t enough to start even a tiny GCR, so that could be viewed as pretty OK as a starting tripwire for safeguards. Interestingly Article 72, which gives the IAEA the power to make special inspections, seems to be one of the Articles held in abeyance until the PROTOCOL tripwire is passed. i.e. could it be the case that the IAEA has no power to require a special inspection in Syria? But if a state is being secretive how does the IAEA show that the tripwire has been passed, short of an obvious major facility starting up? Or have I misread INFCIRC/407? Sources in Vienna elaborated that the uranium traces did neither consist of natural uranium nor enriched uranium. This partly explains the agency’s harsh reaction to the leak. The fact that uranium traces were found at Al-Kibar was presented as further hint that the Syrians in fact are running a secret weaopns program – although even the source that was cited in the story made the qualification that there are many possible explanations for the traces, most of them pretty unspectacular. It’s the one-sided interpretation that induces the political spin in the story. My guess is that the report could give the agency enough diplomatic leverage that Syria will not have much choice than agree to further inspections of the Al-Kibar site and let the IAEA access three other facilities the agency has asked to visit. They could still easily move to special inspections later in the process. Are sniper killings on mediterranean beaches fairly common in Syria then? There seems to be a distinct lack of information on this aspect, but you’d have to argue that (in the abscence of further evidence) it’s a little bit… suspect? I doubt he knocked over someone’s sandcastle, so who’s playing hunt-the-Syrian? The story of his death sounds like a scene from the opening of a spy movie. A top Syrian military official was reportedly sitting at his villa in a fancy beach resort on the Syrian coast on Friday when a sniper arrived in a yacht from the sea and shot him dead. I’ve been googling and asking around since the Syrian FM suggested that uranium might have come from Israeli bombs. There are many assertions that US bunker buster bombs (presumably Israel would use those) contain DU, but nothing that seems credible. Knowledgeable people I’ve contacted also think that the DU story is some cross between an urban legend and propaganda. However, if there is some solid information confirming the use of DU in the GBU-28 or similar, I’d certainly like to get a pointer to it. A recent (2007) Syrian paper says the product of their Uranium recovery pilot plant is Di-Ammonium Uranyl (a type of yellowcake). It seems that Lockheed Martin have a 1997 patent said to prove several US aircraft munitions may use DU. The patent, #6,389,977 (http://tinyurl.com/58jhnb), is for a DU or tungsten penetrator to replace existing weapons. Is there any indication it did? The type of Uranium alloy or compound found is supposed to indicate its source: kinetic penetrator, shaped charge liner, phosphate separation product (or subsequent derivative), or even some mysterious radioactive waste. Since BoE was considered a nuclear reactor it’s plausible that penetrators were used to destroy the core. DU has so many advantages over Tungsten that it’s hard to resist the temptation to use it. This pro-DU article seems more serious than this con-DU one. I guess the IAEA is fighting now for its professional independence. The US is always trying to take over UN roles. Hopefully IAEA analysts have more info on US aircraft munitions than we do. Looking again at the post-strike satellite images I’m about 95% certain that “bunker buster” penetrating munitions like the GBU-28 were not used in the attack. Actually, such weapons are ill-suited for this type of target to begin with because of over-penetration. Even so, the GBU-28 does not contain any DU. It’s impossible to come to any conclusions based on this leak. Hopefully we’ll have some solid information from the Agency experts and not anonymous diplos soon. What’s more interesting is Syria’s response – it didn’t deny that uranium was found at the site, only the source of the uranium. I don’t know if that means anything in the end, but from these kinds of regimes I usually expect categorical denial. Re my discussion above of Syria’s Small Quantities Protocol (SQP) abeyance in its safeguards agreement (INFCIRC/407). I now realise that because Syria has a research reactor (the 30KW miniature neutron source SRR-1) this exemption no longer applies. So all articles of Syria’s safeguards agreement are now being applied. The IAEA has since 2005 sought tighter limits on SQPs by making an end condition “the decision to construct or authorize construction of a facility”, requiring an annual report, and reducing the scope of the abeyance. e.g. as in this agreement with Lebanon. You would not use DU munition to destroy a site like Al-Kibar, that doesnt make any sense(i.e. you would need to use high explosives). The aim of DU is to pierce armour. The heat produced by piercing an armour will disable a MBT or other armoured vehicle (because they are closed, confined vehicles, where often munitions are stored). But if you were to fire DU rounds at a non-operational atomic plant, you would make only holes in it but certainly not destroy it. Why does this train of thought (in my head) inexorably lead to Scooter Libby taking a holiday on a syrian beach? * It’s not clear from the IAEA leaked info if the Uranium was alloyed (suggesting a military application) or compounded (suggesting a nuclear one). The word “compound” was used in the first Reuter’s item but the later NYT report used the word “combined”. Reuter’s later used the word “processed” saying it could mean “enriched”. * Dai Williams says he found traces of natural and low-enriched Uranium in Lebanon following Israeli strikes. Natural Uranium is an acceptable option but low-enriched makes no sense unless an explosive effect similar to the South African aerodynamic enrichment exists. * According to Aviation Week Israel probably used Spice-2000, an indigenously developed missile. This missile’s warhead could contain Uranium. Since Israel have no significant enrichment plant its Uranium is possibly natural. * Some source said Israel used Maverick missiles and Dai Williams says they use a DU rear liner in the shaped charge warhead. The “spice 2000” is simply a guidance kit for a standard MK-84 general purpose bomb. It does not contain any uranium. A Maverick missile would not be used on this kind of target – at most it would punch a hole in one of the walls. The damage I see in the satellite photographs is consistent with the general purpose bombs, probably Mk-84 2000 pounders. I took a quick look at the Dai Williams research. Provided the methodology was sound and results accurate, the enriched uranium found in the single sample was 0.92% U235. Frankly, I don’t agree that one can make the sweeping conclusions the author makes based on one sample, but maybe that’s just me. We’re getting down into the weeds on the depleted uranium discussion, but I note that DU has found aeronautical use as ballast, counterweights, trim weights and such for decades. DU is, for such practical purposes, pretty much the same thing as natural U, so U could also be found in those applications. I have not found any indication of the use of (D)U in bunker buster bombs even in such minor applications, but it can’t be ruled out. Somebody should ask USDoD about it. Opportunities for ambiguity abound. We need to see what IAEA reports next week and go from there. Israeli media take it as a proven fact that IAEA found traces of enriched Uranium. Do they know something we don’t? I doubt it. Our media are effectively controlled by the defense establishment in such matters. Voluntarily of course like good democracies do it. Democracies and totalitarian states achieve similar levels of control over their people. Marginalizing the opposition is just as effective as physical torture.